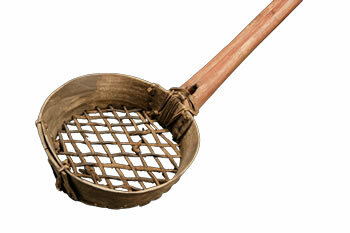 Romig Collection, Moravian Archives, Bethlehem, PA.
Bethel fish trap, 1896. Wassilie Evan noted: "Nets were rare long ago. 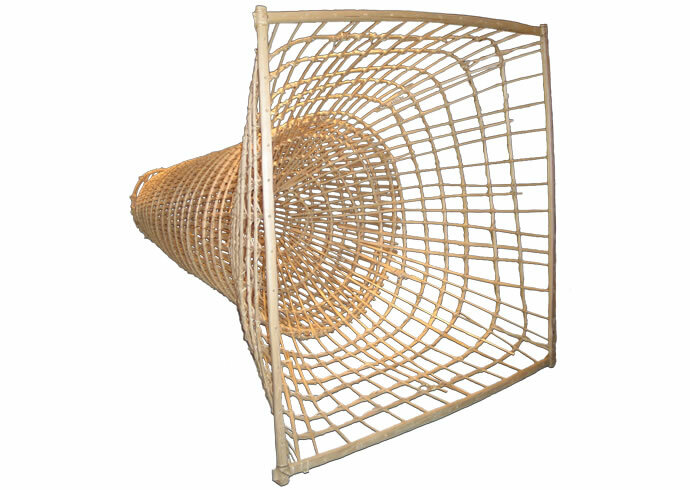 Back in those days those wooden fish traps caught different kinds of fish." Apa'urluma waten mikcuaraulua ayautellranga, nalluluku, piyuasciiganii. Taluyanun cunaw' ayautellinikiinga. Qanrutaanga waten, "Una wani kuigilnguq anluarvigkaqan. Pikaqan elpet anglirikuvet." Tamana tamaa-i, umyuaqluku piamku elliin pillra, cali wiinga iluperanka maa-i ayautetuanka ekluki snukuumun taluyanun, wangtun llu pinrilameng ciuqlirmi tutgaraanka tangvagtellua pirraarlua (apa'urluma pillranek qanrutaqluki). My grandfather took me with him when I was a boy, and I couldn't walk yet and had no idea where we were going. He apparently was taking me with him to check his fish trap. He said, "This spot here without a river will be your fishing hole in future. This hole will be yours when you are an adult." Remembering what he did for me, I also put my great grandchildren onto my snowmobile and bring them to my fish traps, and after I let them watch me, I'd say to them what my grandfather said to me. 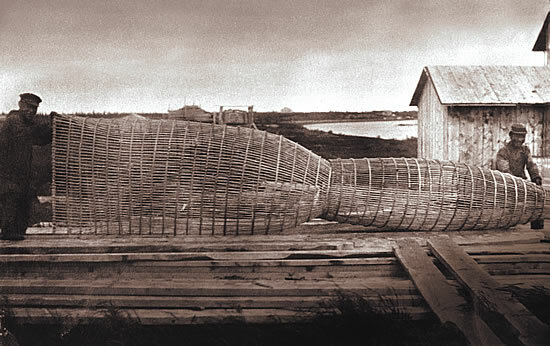 Large fish trap made of split spruce bound with spruce roots by Nick Andrew, Sr. of Marshall and Timothy Myers of Pilot Station in 2006. Note the flat end for easy removal of fish. Nick Andrew said: "They set their large fish traps for burbot. They caught lots when I was a boy, and they looked like piles of cordwood." Unarciaq/Straight-grained wood from which thinner and thinner lengths of spruce were split, first using a wedge and then using the blunt end of a crooked knife. Cigyiit/Split spruce strips laid the length on the trap. Nemiarutkat/Short strips of green wood, encircling the lengthwise strips. Note the center cut, adding to the strip's flexibility. Nekevraarcinraat/Spruce roots soaked in water, split, and used to bind the trap. Dipper used to remove ice from a fishing hole as well as fish from a fish trap. Wassilie Evan noted: "If one removes fish from the trap with one's hands, they will freeze."